As we have learned last week, the four rotator cuff muscles work as a unit to move the arm and to maintain the head of the humerus centered in the glenoid fossa during all arm movements. As such, these muscles are not power muscles, but endurance muscles. When doing rotator cuff strengthening exercises, we need to do a lot of repetitions under low load. With some exercises, this equates to about 20–25 repetitions done 4–5 times a day, so roughly 100 reps a day. It may sound like a lot, but for anyone with a shoulder injury, this will help him or her create a new movement pattern that is well-supported by muscles that do not fatigue so quickly. Another important element is the set up of the head and shoulders before doing the exercises, especially if it is a standing exercise. It is very important that the skull is aligned over the shoulders correctly and that the client has a broad and open chest, as pectoral tightness decreases the ability of the external rotators (the teres minor and insfraspinatus specifically) to contract properly. 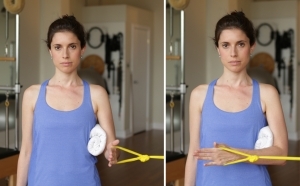 Here are two preparatory exercises that are important to master before diving into rotator cuff strengthening. Slide your shoulder blades together and hold for 5 seconds, then release. Internal rotation is generally stronger than external rotation; you may need to intensify the resistance load. These Pilates-based exercises are more complex and require more control and coordination than the exercises shown above. Make sure your client is able to do the above exercises with good form and without pain. The Pilates exercises are more advanced because they involve multiple body parts moving in conjunction with one another. Coordinated muscle recruitment of the core muscles as well as the muscles of the trunk and often the lower extremity are necessary to move with integrity in these poses. If any of these exercises cause pain or have a faulty movement pattern, observe where the issue is coming from and work those in isolation first before returning to these exercises. The cueing in these exercises is very helpful especially with chin tuck at the wall, robot arms, and lateral rib shifts. Clients with forward head carriage and neck injuries from whiplash found the exercise very effective. Robot arms became easier and clients felt stronger with more repetitions. And side bridge got a lot easier for those previously unable to support with their shoulders. Clients were able to co-ordinate recruitment of the core and trunk and lower extremity to perform these exercises with confidence and ease of movement.